The Andean tropical montane forest ecosystem is one of the most important locations for the preservation of tropical diversity in the world. Over millennia, temperatures have caused plant populations to migrate along the eastern Andean slope in order to find their climatic niche. ABERG is focused on the past, current, and future distributions of plant diversity in this ecosystem. Nonlinear climate change and Andean feedbacks: an imminent turning point? 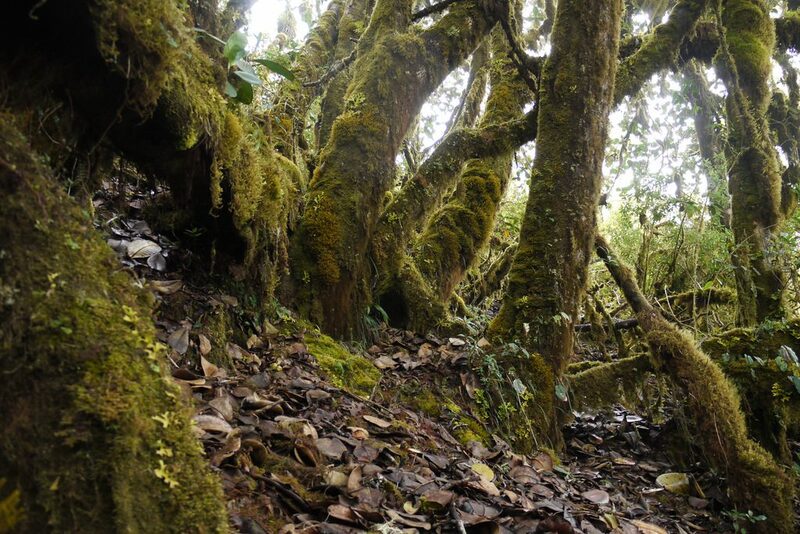 In 2003, Norma Salinas, Miles Silman, Jason Bradford (then of the Missouri Botanical Garden), William Farfan, and Karina Garcia established the first nine 1 ha plots throughout the Trocha Union within Manu Park and within what is now the Wayqechas Cloud Forest Reserve. In successive field campaigns, the total number of 1 ha plots was increased to 22. These plots range in elevation from 750 to 3625 meters in elevation. Monitoring campaigns have identified each individual tree stem and tracked its growth since the creation of the plots. This information has proven critical to understand each species distribution patterns in the context of elevational, climatalogic, biogeochemical, and biotic constraints. Several other plots have been established by members of ABERG. Ken Feeley has established several smaller plots on the treeline boundary to understand how combinations of land use and climate change may affect tropical species migration. Imma Oliveras has also established a network of plots to research trends in fire frequency on the migration and carbon dynamics of Andean forests. Combined, these long-term research plots have provided critical insights into distribution modeling, carbon sequestration, species interactions, and data from them have been incorporated into vertebrate and invertebrate studies. Data from the ABERG tree plots combined with collected neotropical species data from GBIF has allowed for research into distribution projections given regional and global climate change. Miles Silman and Ken Feeley have generated numerous publications on expected distributions and the possibilities for extinction for tropical montane tree species. These papers suggest expected extinctions for montane cloud forest species with climate change and imperfect upslope migration.